A couple of weeks ago we received an opportunity to try out Pen Pal Kids for 90 days. 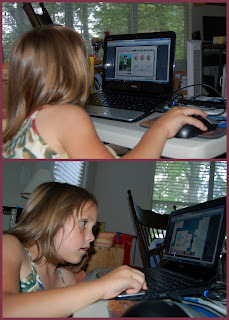 What is Pen Pal Kids well very simply put its a social networking website for kids. Its fun, educational and most importantly safe. First both the child and the parent need to create accounts. Gwyn had lots of fun choosing a username and creating her avatar. It's important that you know Pen Pal Kids is very safe and fully compliant with the Federal Trade Commission (FTC) and Children’s Online Privacy Protection Act (COPPA) www.coppa.org. PPKC has also recently earned the TRUSTe seal of safety, www.truste.com. The website is advertiser free so there is no worrying about your child clicking on something they shouldn't. In the parents account you will be able to track when your child logged onto the website and everything they did while they were visiting. You can also choose to have the private messaging feature set on or off. The private messaging feature controls what your children can type into their postcards. With the private messaging feature turned "on" your child can write to their pen pals by answering multiple choice questions. If its turned "off" they will be able to write anything they choose. I choose to have the private messaging feature turned on for Gwyn because its safer and easier for her to use. The website is very easy for children to navigate on their own. On the home screen there is a very easy to use navigation menu displayed on a wooden trail guide sign. Children can choose to play a game, find a pen pal, read their mailbox or visit the library. In just a week Gwyn has made three pen pals. And she asks everyday if she can log in to see if she has gotten more. When we first logged onto the website Gwyn decided to check out the games. All of the games are wonderful and very educational. Children will learn about different cultures, foods, flags, geography and more. She really enjoyed the My Mysterious Mysteries and They're There games. Next we decided to find some pen pals. There are several ways to find pen pals. The main list will recommend pen pals with similar hobbies, favorite foods, favorite animals etc. Or your child can choose to search by using the favorites drop down menus. We decided to just go through the recommended list and selected several. Gwyn was very impatient and wanted a pen pal immediately so I had to inform her that because of time differences the pen pals she choose were probably sleeping. So make sure you let your children know it may take a few days to make a pen pal. Since Gwyn can be very impatient I was happy to see that Pen Pal Kids Club sends postcards as well to the children. And they are wonderful. The postcards PPKC send share facts about countries/cultures and have wonderful pictures. Gwyn really enjoys it when I read them to her. After she made some pen pals she sent her first digital postcard. I read the list of subjects she could choose and she choose to write about her favorite hobby. On the 2nd screen I went through the drop down menus and read the options to Gwyn. She told her pen pal that her hobby was drawing, that she does it almost every day and that she likes to draw because it helps her relax. Then she choose a beautiful horse picture for the front of her postcard and we hit send. Gwyn is hoping her pen pal will respond and tell her all about her favorite hobby too. In the club house children can view the postcards they received, check out their rewards (which they get by completing games, sending postcards, etc), and upload a video (parents must approve all videos from the parent account). Children can also change their avatar and passport favorites anytime by clicking on their avatar and user name in the upper right. In the library which is powered by Encyclopedia Britannica children can learn all sorts of amazing things about geography, social studies, history, cultures and more. This is a great homeschool resource to utilize when completing unit studies. And one additional feature I would like to mention is that the postcards can be translated into 7 languages: English, Spanish, Japanese, Chinese, French, Italian and German making it even easier to communicate with children in other countries. I like the fun games. I like writing to my pen pals and I like receiving postcards. I learned all about flags and other countries. I hope some of my mommies friends kids will join so I can send them postcards. The cost for a subscription to Pen Pal Kids is just $2.99 a month or $29.99 a year. Everyone gets a FREE 30 day trial. Pen Pal Kids has graciously offered to give away a 90 day subscription to one lucky reader. Only the first entry is mandatory. Other entries are optional and give you extra chances. This giveaway is not affiliated with Facebook in any way. The winners will be posted on the blog and will be emailed. Winners must reply within 48 hrs with their contact information or another winner will be chosen. Since the prize is an online class the instructions for accessing the course will be emailed to the winners. *Disclaimer - I received 90 access to Pen Pal Kids Club in return for my honest review. Please note that prices indicated in the post are subject to change. I was not compensated for my review and all opinions are our own! Many of the links found on my side bars and in my blog posts are affiliate links. As a result, I might get paid money and I will most likely spend the money on homeschool supplies. What a fun idea! I remember having my own pen pals when I was a kid. Love the concept of online! I would like to visit Costa Rica!